Well I made this card from an idea from Kay (Hougie crafts) book called mini master piece book and it's called gift in a bottle card. It is the bebunni birthday cd rom and I used the card companions section. 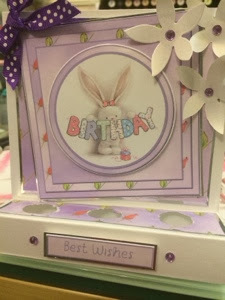 I used mirri card for matting and layering, I added purple ribbon, gems and the flower die cut from my stash. I am just waiting to add the 3 bottles and I am going to fill one with purple dew drops, purple glitter and purple sequins. I think I am purple mad lol. Beautiful job Sam! The image is so cute. Really cute image - great card.